An electron will radiate when it is decelerated, so electromagnetic waves carry energy away from the electron. In space, a free electron that passes near a charge feels a small perturbation, and becomes more stable by emitting an electromagnetic wave. After emitting this wave, the electron will be moving slower, since it has lost energy. This form of emission is often referred to by its German name, Bremsstrahlung, which means braking radiation. Since the electron was free before it emitted the electromagnetic wave (it was not trapped in an atom) and is still free after emission has occurred, it is also known as free-free emission, and we will use this name here. 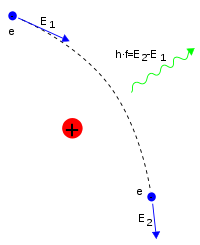 Below is a sketch of an electron (blue circle) passing near an ion (red circle) and losing energy by free-free emission (green wave). For free-free emission to occur, a fast electron must pass close to another charged particle. This form of radiation will therefore occur more often in regions of high density, because the electron will have a higher chance to come close to a charged particle that will perturb it. However, for free-free emission to occur, the gas must also be ionised, so that the electrons are free from the protons, rather than bound in a hydrogen atom. The amount of free-free emission depends on the temperature of the ionised gas and it is a type of thermal emission, and because the emission is continuous with frequency, it is described also as continuum emission. Clouds of ionised gas near regions where young stars are forming will emit free-free radiation. It can therefore be used to trace this gas and to study the surrounding regions to where new stars are born, since it gives information on the temperature and density of the gas. 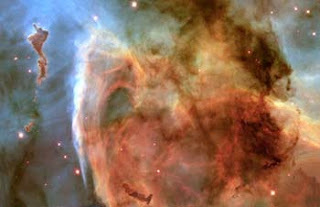 As an example of such a region, below is an image of the Carina nebula, courtesy of the Hubble Heritage.